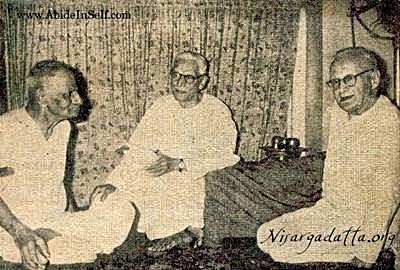 According to Nisargadatta Maharaj, Maurice Frydman was a 'jnani', (a liberated being). It takes one to know one. This unpretentious Pole, who was born in 1894 in a Jewish ghetto in Krakow, had an uncanny knack fir himself discovering 'jnanis' and in the most unlikely places. But quite aside from this, Frydman's activities helped, enriched and changed forever, the lives of an amazing number of people and yet, to this day, he is so little known and he wanted it that way. He stumbled across Nisargadatta Maharaj discoursing outside his biddi shop in the streets of Bombay and in due course, translated transcripts of his discussions and teachings into a book that has become a spiritual classic. I Am That, drew and continues to draw, many western seekers to India. If anyone was 'anonymous' in the truest sense of the word, it was Maurice Frydman. Five foot nothing, Maurice moved with some of the great Indian figures of his time including Gandhi, Nehru, and Jai Krishnamurti. Sometimes, truly great people, who have shaped and helped to transform the lives of countless beings, remain unknown and unheralded until long after their passing. Kindly donated by an anonymous friend. Maurice Frydman was a modest and humble human being and yet his is not a life to be taken 'lightly.' This diminutive man was a giant in his own right and his 'story' should be told, not for the sake of the 'story,' but because it so aptly portrays how pervasive and powerful compassionate and ego-less goodwill is able to have a profound effect which continues to influence lives for decades and beyond. Very often these days, when we hear about the philanthropic activities of various wealthy or influential people, there is a strong colouring of 'egoism' and 'doer-ship' involved. As helpful and wonderful as many of these activities often are, they are almost always bound to a 'doer', a 'somebody,' who in some subtle way or other is gratified, satisfied, pleased, feels important, feels worthwhile, etc. This is all well and good and infinitely better than the self-centered, narrow lives that most of us lead. However, much of the philanthropic activity that we see today is but the ‘child,’ or the ‘seed cause’ of future great and selfless compassion. Rare indeed, is it, to stumble upon unconditional compassion in full flower. Maurice Frydman was one of those rare beings in whom the spirit of compassion flowed spontaneously without any attachment to 'doer-ship' or ‘outcome.’ Although he was a philanthropist in every sense of the word, it was of a very different kind from what we usually see. Yet it is because he was so unassuming and genuinely 'ego-less' that his activities were and continue to be so powerful in their effects. Great compassion flows spontaneously and reaches far, wide and deep. It has no boundaries and is by nature non-sectarian. This man accomplished many, many things in his life but here we will focus upon just one as it is little known even to those who have most benefited by it. This pertains to the tireless and extraordinarily compassionate work that Frydman did on behalf of Tibetans fleeing their homeland during the later part of the 1950,s and early 1960,s when the Chinese invaded Tibet. Although it is not well known, it was Maurice Frydman, who set up and executed a plan that was put in place in order to secure the escape of the Dalai Lama from Tibet. It was also due to Frydman that a vast library of written works were able to be successfully smuggled out of Tibet. These precious writing would have been lost to future generations had it not been for his foresight and careful planning. Most of these texts are now stored for posterity in a modern and well-appointed library in Sarnath, India. Frydman organised for the Dalai Lama to be secretly carried on a private train to Delhi where he was able to meet with Jarwhal Nehru shortly after his escape from Tibet. If it were not for this carefully thought out plan, it is very likely the Dalai Lama would not be alive and well today. Understanding the problems faced by these displaced people, who had suffered so cruelly, not only in the manner in which many of them were forced to leave their homeland but then in having to adjust to the climate of India with its heat and rigours for which the Tibetan constitution is so poorly adapted. Here also, it was Frydman, who at his own expense and after much negotiation with Nehru, travelled the length and breadth of India looking for suitable, higher altitude locations where the refugees could safely and with dignity, be relocated. Despite this, many perished during those first years but many also survived and thrived. All the settlements where Tibetans are now living in India; namely Dharamsala, Bir, Beylacoupe and Tashi Jong to name a few, were discovered, negotiated and established through the skilful efforts of Maurice Frydman. He was a remarkable man, humble, devout, compassionate to the core of his being and generous to a fault. You may like to know where I got my information? Sri Ganesan, the great-grandnephew of Sri Ramana Maharshi knew Maurice Frydman well. They were close friends for many years as Maurice often came to visit Ramana Ashram at Tiruvannamalai, even after the Maharshi passed away. However, Ganesan ji, did not hear the above story from Maurice himself, despite having moved closely with him for many years. He came to hear of it only after Frydman had passed away. Yet another testament to the humility of this man. The story came out via an impeccable person who was working in close unison, at one time, with Mahatma Gandhi and Jarwal Nehru, his name was Apa Pant. Before concluding this article I would like to include a passage by one of Maurice's most staunch devotees, the man called Apa Pant, who at one time, held an important official post in the tiny Buddhist state of Sikkim. It recounts very poignantly, the final days of Frydman’s life and leaves us with an indelible impression. 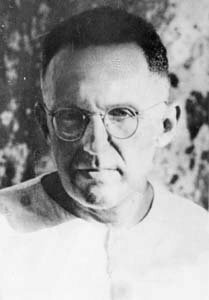 Maurice Frydman died in Bombay on March 9th of 1976 with Sri Nisargadatta Maharaj by his side. A beautiful event ended this incredible life. During his last days, Frydman got a visit by a professional nurse he did not know. The nurse had been visited in a dream by an old man in a loin cloth who told her to go and take care of Frydman. Frydman refused to accept the nurse’s offer. But, as she was leaving the house she walked past a picture in the hallway and recognised the old man whom she had seen in her dream. Upon telling Frydman this, he accepted her offer and allowed her to take care of him. The picture: was Sri Ramana Maharshi who had left his body over three decades prior. thank you, wonderful article. questions, the book, when out? who is the author, publisher? Hi Michael, so glad you found the article inspiring. Really its amazing how little is known about him. The Bio that is being written has been a work in progress now for some two years or more. I am not sure why there is a hold up. I believe Godman began writing it with the intention that it would be an article of just a few chapters which would be included in something else he was about to publish but he then discovered just how much rich content and how many unknown stories there are about him.The writer is David Godman, who has written already a number of wonderful books on various disciples of Ramana Maharshi. I will try to make more inquiries about the up and coming book when I head back to India. Best wises. hi lyse, thanks so much for your reply. glad to hear that David Godman is working on this book. I am also a big fan of his various Ramana books. He is the one for this project. Blessing wishes to all. I agree completely, Godman is the man for this job... the ex investigative journalist...! i guess he did not expect to find so much interesting material about Frydman's life. But if anyone can sniff out a few good stories it is him and Maurice Frydman's 'story' deserves to be told. Best wishes Michael. Who did the painting of the snow capped mountains in the background??? Hi Dennis. The painting was done by the nineteenth century Russian mystic, painter and scientist Nicholas Roerich. He traveled throughout central Asia, Mongolia and Tibet and painted many canvases along the way. Thank you for sharing with us Murali. One can imagine that those 'unofficially' initiated by Maharaj must be in their hundreds. A priceless gift indeed! There is something truly humbling about the life of Maurice Frydman. Here is a true exponent of non dualism. May you have many more auspicious meetings. Excellent article, I was reading the book by David Godman about the life and teachings of Sri Nisargadatta and found the reference to this man -Maurice Frydman- and realized how unknown but certainly remarkable human being he was. Amazing. A life devoted to work in silence! Just great! Thanks for this article. As I go through I Am That, have become more intrigued by MF and suspect there is a lot of him that comes through in this book.